A traveler in ancient Israel had to take food on his journey—for himself, his family and his animals. No traveler would set out from home without taking food along. Most family travel occurred at the time of yearly Festivals in Jerusalem. Men and boys aged 12-13 were required to attend the Festivals (The Life and Times of Jesus the Messiah, Edersheim), but women and children often went with their husbands except for special circumstances (1 Samuel 1:22). Traveling by foot or pack animal meant women had to prepare meals in a camp setting, without refrigeration. In general the food kit would include bread, grain, dried fruit, olives and olive oil. It is thought that women prepared the main meal in the evening when it was cooler and the family could relax (Illustrated Manners and Customs of the Bible, Packer and Tenny, page 466). 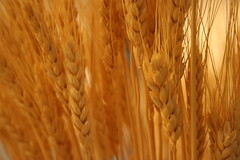 Commentators agree that wheat in various forms made up about half of an Israelite’s diet, either in the form of parched grain or bread. The women baked bread daily by pouring dough over fire-heated stones. If they cooked legumes or vegetables to make a boiled stew, it would accompany the fresh bread. The parched grain, raisins and dried figs prepared ahead of time would be energy foods. Grain, wine, oil, sheep, goat and ox are the foods mentioned in connection with the instructions for keeping the Feast (Deuteronomy 14:23). It nice to have you here Bernice. Thanks for stopping by!